A commonly forgotten food in relation to weight loss is the egg. This article points out the role that eggs play in the weight loss scheme. 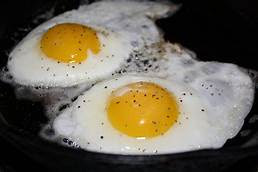 It has been shown in studies that eating eggs for breakfast adds to a feeling of fullness and causes one to eat fewer calories over the next 36 hours in women and over the next 24 hours in men. People who ate eggs for breakfast felt more full. It has been shown that men ate 270-470 less calories at lunch and dinner after having eggs for breakfast. Eggs contain choline which promotes normal cell activity and liver function. It aids in the transportation of nutrients throughout the body. Choline also is important in the development of baby's memory. You are probably wondering why I haven't mentioned cholesterol. There are recent recommendations from the American Heart Association, the American College of Cardiology and American Diabetes Association that no longer limit the intake of eggs or cholesterol. In fact, eggs are promoted as a part of a heart healthy diet.by such organizations as Health Canada, the Canadian Heart and Stroke Foundation the Australian Heart Foundation and the Irish Heart Foundation. So, it seems, eggs can be the "go to" food for hungry dieters. They are not only cheap they are easy to prepare. Keep a few hard boiled eggs handy in the refrigerator for snacks.